Have you seen the flammable cladding stories in the media? Industry experts hold serious fears that there may be thousands of properties nationwide at risk from non-compliant, flammable cladding on their building’s exterior, as seen in London’s deadly Grenfell tower blaze. In February, 2019 Australia witnessed its second major cladding fire at an apartment building and at Ace we’re issuing a call for apartment owners to take control of their community fire safety. You can’t start a fire without a spark is both a catchy line and a very practical lesson for owners nationwide and we’re urging owners to make an effort to decrease the risks that balcony smoking holds for their community. The fire at Melbourne’s Neo200 building on February 3rd marked Australia’s second major flammable cladding apartment fire and incidentally, both fires have been sparked by a discarded cigarette on apartment balconies. 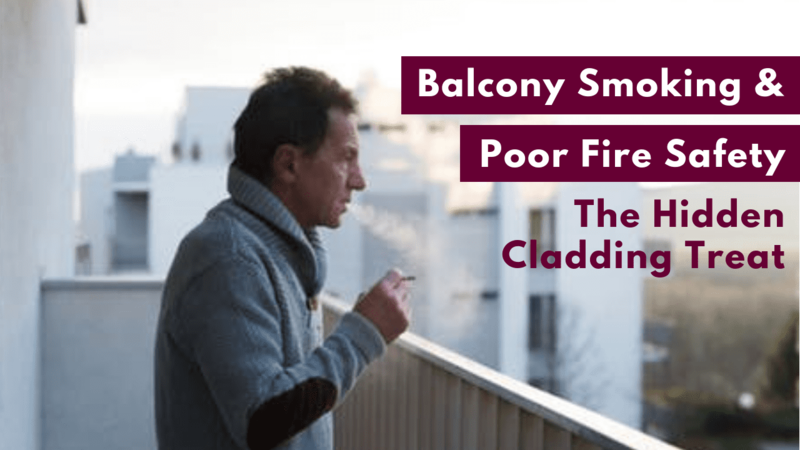 There are lessons to draw from that and it is important owners quickly discuss how smokers on balconies will not add to the risk profile in their community. What do our by-laws say about smoking and/or smoking on balconies? Is there a proper process for the disposal for cigarettes on balconies in our community? Are residents/tenants aware of proper use of balconies? Asking these three questions will help identify any gaps in your community fire safety exposed by balcony smoking. It’s important to note that communities can address the risks of smoking with respect to cladding without embarking on a witch hunt of smokers in their community. Unless your state legislation or by-laws say otherwise, private lot owners are entitled to smoke on balconies so long as it does not cause a smoke drift nuisance and this shouldn’t be taken up as a way to attack an individual’s lifestyle. But it would be remiss to place the blame solely on smoking. Ace manages over 60,000 lots nationwide and we’ve observed that poor fire safety processes can add to the problem in a big way. The use of balconies as storage areas by apartment owners combined with smoking is proving a dangerous mix. Balconies filled with storage items, discarded cardboard boxes and other items are becoming a common sight in Australia’s high-rise buildings, which is a fire safety hazard in itself, without throwing cladding into the mix. At the very minimum, owners corporations need to address the way in which balconies should be used by owners and tenants to avoid unnecessary safety risks. There are a host of fire safety issues that owners appear to be out of their depth on and we’re encouraging concerned owners to get advice from a professional strata manager to control the situation. Body corporate committees are for the most part run by volunteer owners without a great deal of expertise in matters like this, so it’s important concerned owners consider the value of having a professional on their side to stamp out the risks of fire in their community. Better by-laws relevant to balcony use or just an expert’s management of a fire safety maintenance plan could be all the difference at buildings suspected of housing unsafe cladding and we’re urging owners to act now. Have you seen the flammable cladding stories in the media?.